In 2014, the U.S. Government announced the release of the SRTM 30-meter resolution global dataset, also known as SRTM-2. This is the highest quality digital elevation model (DEM) now publicly available. Among its many uses, the higher resolution data enables more accurate modeling of floods, coastal storm surges, mudslides, and volcanic lahar flows. Following the announcement, our Working Group on Capacity Building and Data Democracy (WGCapD) set out to make 30 m SRTM-2 data available to countries that need it through regionally focused workshops, hosted by respected institutions with expertise in DEMs. These workshops will help practitioners incorporate SRTM-2 data into their existing processes and projects, teaching them how to actively use 30 m DEMs. The first WGCapD-organized SRTM-2 workshop of 2015 was hosted in March, 2015 by the South African National Space Agency (SANSA), targeting disaster management practitioners in the southern Africa region, with a particular emphasis on the TerraHidro and CREST flood models. This workshop supported practitioners in countries in the Latin America and Caribbean region (LAC), particularly those developing disaster early warning and emergency response systems. 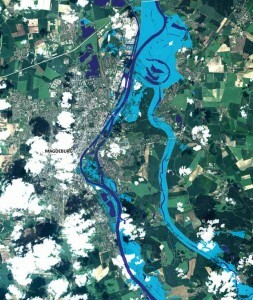 The range of common disasters to be addressed includes flooding events, which have a large impact on economic and social development, and other disasters such as landslides. The objective of this workshop was to build capacity in understanding and using 30 m DEMs derived from SRTM-2 data in flood modeling and, time permitting, other applications. professors / instructors in GIS or remote sensing. Individuals in a position to train others were particularly encouraged to apply. Decision-makers and managers from disaster prevention and civil protection institutions who might benefit from timely and accurate information were also considered, with knowledge of GIS as a prerequisite.